Look at these wonderful bottle holders! I absolutely love them. They provide a soft place to grip a bottle, a fun decoration and a lovely little project! You can whiz up your own very quickly, supplies are easy to get hold of and you will be sure to fall in love with them. I'm definitely going to be making many, many more! Right! Lets get started. 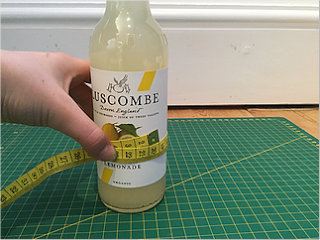 To begin with, measure around your bottle using a tape measure. Then add on 5 cm to the length (mine was 20cm, so total was 25cm). For the width, I decided 10 cm was around the correct length for my bottle, but depending on your bottle size that will need to change too. Cut one piece from your outer fabric (so mine was 25cm x 10cm) and another piece from your inner fabric. If you are using fusible fleece, cut it 1 cm smaller on all sides, but if, like me, you are using batting, cut a piece the same size as the pieces of fabric. Ok, time to create a 'sandwich'. You should have three layers: the outer fabric, the inner fabric, and your batting. 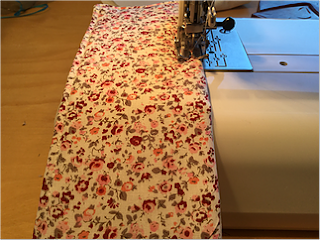 Put them together like this: inner fabric face up, outer fabric face down, batting on top of the outer fabric. Make sure the order is correct! Double check before pinning. 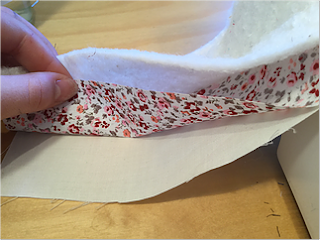 Sew around your three layers, making sure you leave a hole at the top. Once you have sewn around your fabrics, turn the rectangle the right way out. Your batting should be in between the outer fabric and the inner fabric!! 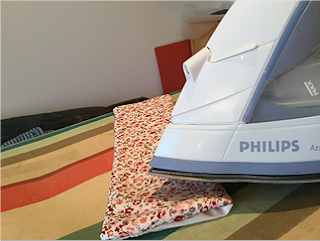 Tuck in the edges of your hole and iron it all flat. Time for some top stitching! 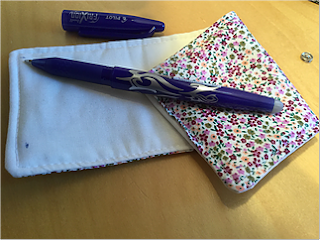 This has a double bonus: not only does it look lovely, but it also covers up your hole very neatly, so you don't have to slave away sewing it up with a needle and thread! Make sure you keep your stitching in a strait line (I lined my fabric up with the inside edge of my foot). You can use a colour co-ordinating thread, or you might decide to go for a nice contrast! This is the final step - wasn't that easy?! 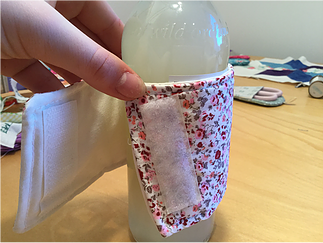 To fasten your bottle holder, stick your velcro onto the outer fabric of one side and the inner fabric of the other. Make sure to line it up right, so it isn't too loose or too tight. I used sticky velcro so I didn't sew around it, but if you are using normal velcro make sure to sew around using a matching thread. For my other bottle holder, I used poppers to fasten it (this meant that I didn't make it as long at the start). To make sure your poppers are straight, use an iron-off pen (frixon works well) and draw four little dots where the poppers are going to go, and then hand sew them on. I hope you enjoyed making these bottle holders! 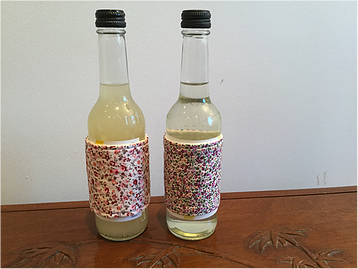 They make lovely gifts to go with a drink, or you could stock up yourself for summer! Brilliant, I think I like the idea of the poppers best but only because I've never had much luck with stick on velcro. But that might be down to user error. The bottle holders are awesome! I think I need a set of these for refreshments on the porch! *Thanks for leaving a comment on my blog about the Christmas quilt along block. I've noticed that you are a no-reply blogger. This means that when you comment on a blog, it's difficult to reply back without tracking you down. If you enter any blog contests or giveaways, your name will be overlooked because of this. To fix it, just google "no reply blogger fix" and you'll find many posts to help you. 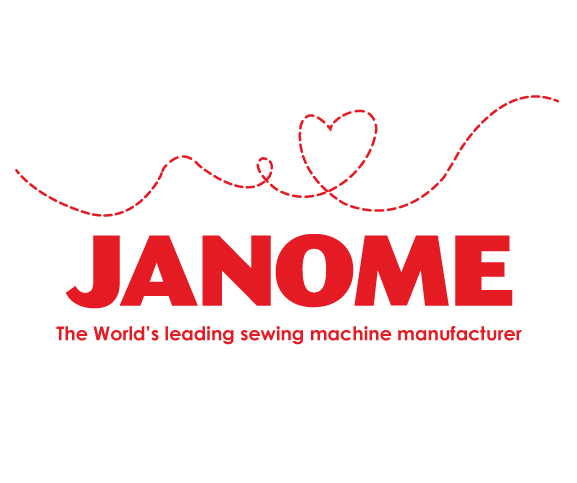 Good luck and keep sewing! Thank you for such a cute idea! They would make lovely Christmas presents for family and friends.